If you would have looked at our little art business a year ago you would have said “Ah, they are local, stay local, do local fairs and festivals.” and that was very much true. We stayed within a geographic boundary, daring only to adventure beyond our comfort zone once to the Colombus Ohio area, and once to Sauerkraut Festival in Waynesville, just south of Dayton. We have been somewhat apprehensive of the added expense of travel, lodging, gas, and the like. And the larger shows are more costly. But when we have taken the courageous leap, paid the more sizable fee after the jury advised our acceptance we have discovered there is a different level of art buyer attending higher level shows. These are the collectors, who are looking for that piece to add to their collection, or they understand the depth of talent and skill and wholeheartedly want to support the arts. We saw this spirit at the Art Craft Holiday Show. And Textile Art Alliance always attracts knowledgeable patrons. And yes, Great Lakes Art Fair was another watershed of art patronage. In all three of these events a portion of the artists are local, but a portion are not. This got us both talking. In Cleveland the silk has a small market – several beautiful boutiques carry my work, and the silk sells occassionally. 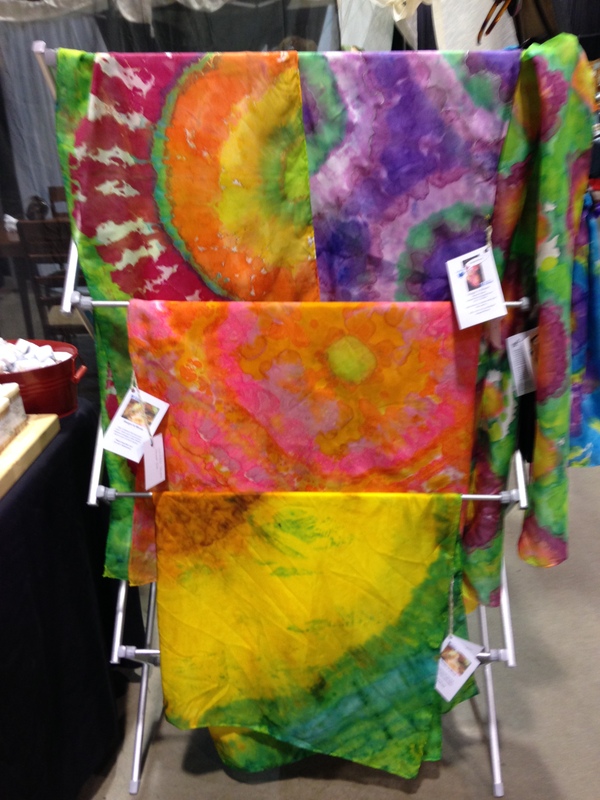 I participate in one event in the fall, Cleveland Museum of Art’s Textile Art Alliance, where the silk does well because it is one of a kind, wearable art, and something special. For that event I watch fashion, and dye to the fall and spring of the following year palate to capture that market of buyers. But in Detroit i was blown away with patrons making purchases of my largest pieces first. Without wincing they handed a credit card, and purchased the silk. So i walked the art fair to see what else was there in fiber. Ah yes, the wet felted vests, scarves, shawls, capes. Lovely, beautiful, and nothing like my work. And the upcycled clothing that has been restyled with panache… yes, also beautiful but nothing like my work. And the lady from Bylorussia who does cold batik – a process of painting patterns on silk. – also very beautiful but a completely different skill set… and nobody was doing shibori…. possibly explained by popularity. Is there a different market when you leave home? Does traveling away from the known, local and comfortable have benefits over remaining local. Yes, i think it can have benefit. We are still answering that question. A busy week ahead of us. Yes, we went to the dogs!